New Delhi: IndusInd Banktoday announced collaboration with Samsung Electronics to enable its MasterCard and Visa Credit Card customers to use ‘Samsung Pay’. IndusInd credit card holders can now ‘tap and pay’ at merchant outlets having Point of Sale (PoS) terminals using a wide range of Samsung Smartphones. Samsung Pay is a revolutionary payments system, which is ‘Simple, Secure and accepted Almost Everywhere’. Samsung Pay allows customers to simply tap and ‘pay on the go’ using their registered IndusInd Bank Credit Cards. Samsung Pay works with patented Magnetic Secure Transmission (MST) technology as well as Near Field Communication (NFC) and hence can be used seamlessly at around 3.1 million Point of Sale (PoS) card machines across the country. 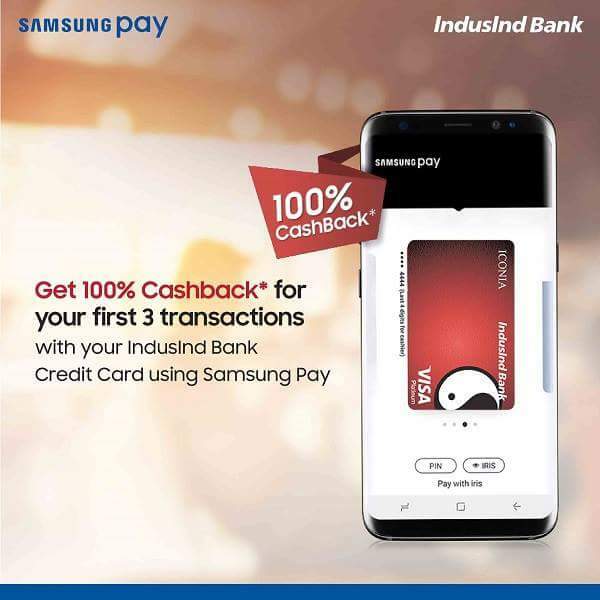 As a part of the launch and customer engagement strategy, IndusInd Bank Credit Card customers who have an eligible Samsung device can get 100% Cashback on their first 3 transactions till April 30, 2018. Anil Ramachandran – Head, Marketing & Corp Communication and Retail Unsecured Assets at IndusInd Bank said, “IndusInd Bank has always been at the forefront of responsive / digital innovations. The coming together of Samsung, which is one of the world’s most trusted Smartphone companies with IndusInd Bank has created huge convenience for our customers. Enhancing customer convenience is an integral part of our business mantra, and this is a definitive step in that direction. Jubilant Bharat Foundation comes with a innovative app to Improve primary education in Greater Noida!